This antibody does not react with plasma cells. Our Abpromise guarantee covers the use of ab1172 in the following tested applications. 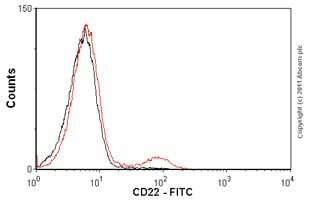 Overlay histogram showing peripheral blood lymphocytes stained with ab1172 (red line). The cells incubated in 1x PBS / 10% normal goat serum / 0.3M glycine to block non-specific protein-protein interactions. The cells were then incubated with the antibody (ab1172, 0.03 µg/1x106 cells) for 30 min at 22°C. Isotype control antibody (black line) was mouse IgG1 FITC (2 µg/1x106 cells ) for 30 min at 22°C. Acquisition of >5,000 events was performed. ab1172 has not yet been referenced specifically in any publications. Publishing research using ab1172? Please let us know so that we can cite the reference in this datasheet. Thank you for taking the time to complete our questionnaire and contact us. I am sorry to hear you have had difficulty obtaining satisfactory results from this antibody. The details you have kindly provided will enable us to investigate this case for you and this is also helpful in our records for monitoring of quality. Reviewing this case, I would like to offer some suggestions to help optimise the results from ab1172. I would also appreciate if you can confirm some further details: 1. Please confirm which particular cell line has been used? Please provide more details. What expression level of CD22 is expected? 2. Could you confirm if a postive control such as fresh lymphocytes or Raji cell been used? I can suggest this would be beneficial. 3. To increase the signal, I can recommend to try a higher dilution of 1:10 (10 µl per 1x10e6 cells in 100 µl sample as suggested on the datasheet). In the event that a product is not functioning in the applications cited on the product data sheet (and the problem has been reported within 6 months of purchase), we will be pleased to provide a credit note, free of charge replacement or refund. I hope this information is helpful, thank you for your cooperation. Should the suggestions not improve the results, please do not hesitate to contact me again with the further requested details.